Valentine’s Day is always a fun day at our house. The kids are super excited to trade those valentines at school. But the house could use a few decorations to get the rest of us in the mood. I’m thinking decorations on a budget will be just the perfect thing! Enjoy! 1. What a great idea to put a gift bag in a frame. All these items were purchased from the dollar store! Awesome! 2. Take your candles you already have and cover them with some adorable scrapbook paper. Instant and easy decorations! Here. 3. I Love You because frame…. super inexpensive and it’s a gift that can last all year! 4. This is a great Valentine’s Day centerpiece. Careful, or your kids might sneak your decorations! Ha! Here. 5. Using shims in your décor? What a great idea! I love how it looks so uneven and natural! I think I could do this one. Here. 6. If it’s centerpieces you need, these Valentine mason jars hit it out of the park! Love how adorable and cheap they are! 7. This Framed Heart Art is super cute and easy for kids! 8. Make a Love Bucket! Such a sweet and cute way to show your family a little love! 9. Another great dollar store decor item, these hearts would look great on a mantel. 10. What a fun idea! Use an old keyboard for a fun message! 11. Need a party backdrop? You’ll never guess these are made from plastic tablecloths! 12. 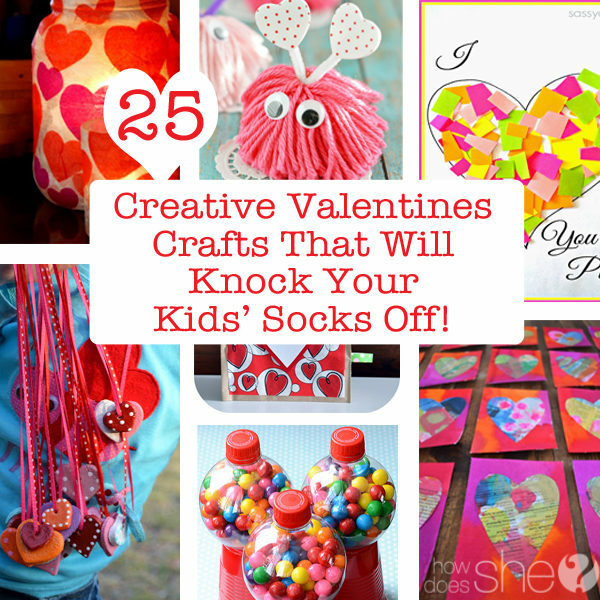 All you need for this is a quick trip to the craft store and you’ve got it made! 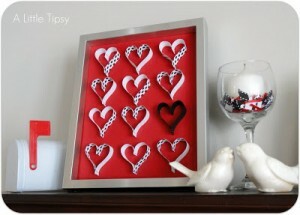 Learn how to make a Duck Tape Valentine Frame here! 13. Did you ever think of decorating with straws and cupcake liners? Great way to use up your old stuff! 14. This Valentine’s Banner doesn’t take much to add a little pizzaz! 15. I’m loving these Yarn Love Letters! How cute are they? 16. How about spray painting some beans? What a great economical way to decorate! 17. Love how easy this Valentine’s Day Votive is! 18. 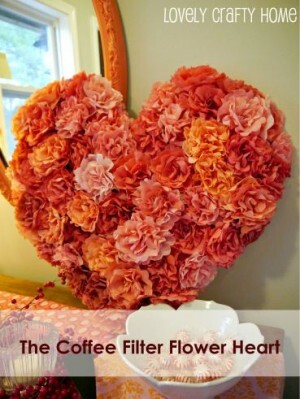 Wow this Coffee Filter Flower Heart Decor is gorgeous! Never would have thought to use coffee filters! 19. I’ve seen glittered ornaments all around at Christmas time, it’s awesome to see how someone used that same idea for Valentine’s Day! 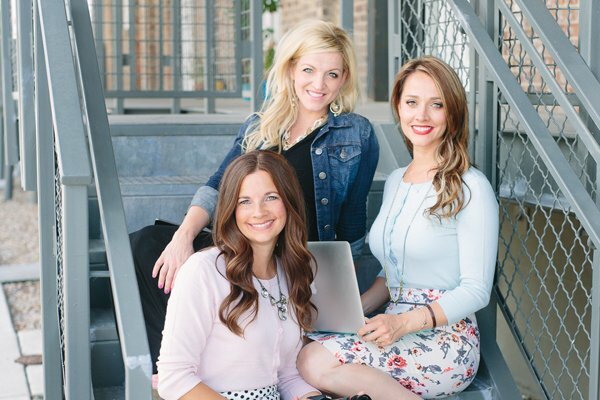 Check out the glittered jars here! 20. Arrows are all the rage these days! Check out how to make them with popsicle sticks here! Just in time to get a few of these made before the big day next week! Woohoo! The kids will be excited! Oh darn they must have taken it down! Basically you pour the pledge wax in the jar, swish it around and turn it upside down and let the excess run out, then shake your glitter inside and the floor wax acts as a glue for the glitter, coating the inside of the jar with glitter. Good luck!